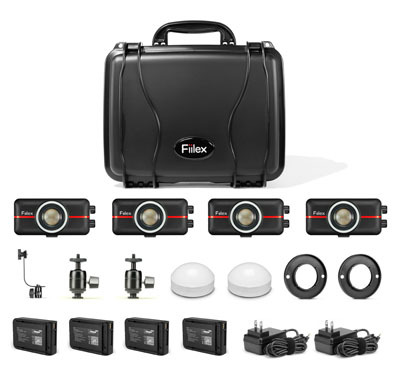 San Francisco, CA - June 5th , 2014 -Fiilex, a leader in LED lighting for the broadcast, film and photo industries, announces the release of their latest lighting kits the M221 “Go2 kit” and the M421”Go4 kit”. The Go2 features two P100 lights, and the Go4 features four P100 lights. Each light comes with its own built in battery, which will last up to two hours at full power. Each kit includes multiple accessories and an extremely durable case that will fit under most airline seats. The P100 is a 100W equivalent 12W Draw LED light with an adjustable beam angle of 30° - 54°. Its unique rectangular form factor allows it to be placed on almost any flat surface and can provide excellent fill, accent or even key light. The P100 has an adjustable color temperature of 3000-5600K so most existing light sources can be matched with just the turn of a dial. It is compatible with all of the Fiilex magnetic accessories with the addition of the included P100 Accessory Mount. "The P100 is a very popular tool with filmmakers, and those that like to get creative with their lighting," says Brent Siebenaler Brand Manager for Fiilex, "Since we started selling the P100 we have constantly received requests to put multiple units in a kit, so we created the Go2, and the Go4 to meet that demand." The M221 "Go2 kit" Includes : 2 P100 LED Lights, 2 Li-ion/Rechargeable Batteries, 2 AC Power Adapters, P100 Accessory Mount, Dome Diffuser, On-Camera Mount, Half Yoke, and a hard shell Travel Case. The US retail price of the "Go2" is $1,095.00. The M421 "Go2 kit" Includes : 2 P100 LED Lights, 4 Li-ion/Rechargeable Batteries, 2 AC Power Adapters, 2 P100 Accessory Mounts, 2 Dome Diffusers, 2 On-Camera Mount, Half Yoke, and a hard shell Travel Case. The US retail price of the Go4 is $1,995.00. The Go2 and the Go4 Lighting kits are available now from dealers throughout the US, Canada, and Europe. For a complete list of dealers and accessories please go to www.fiilex.com.